Freda Bedi (sometimes spelled Frida Bedi, also named Sister Palmo, or Gelongma Karma Kechog Palmo) (5 February 1911 – 26 March 1977) was a British woman who was the first Western woman to take ordination in Tibetan Buddhism, which occurred in 1972. She was born in Derby, England. Freda Bedi was born in a flat above her father's shop in Derby. The family appears in the 1911 Census when Freda was two months old. Her father was killed in the First World War, in 1918, and her mother remarried in 1920, to Frank Norman Swan. She studied at Hargrave House and then at Parkfields Cedars School, both in Derby. She also spent several months studying at a school in Rheims in northern France. It triggered a deep-seated yearning that was to last all her life. As always Freda turned to books to find out what this yearning was, and what it meant. "I read the Anglo Catholic writers, and the biographies of the saints. The life story of Saint Therese of Carmel, the book of Saint John of the Cross, trying to find out how they had reached this exalted state. It was a turning point. I discovered all these saints of the past had sought Reality, the Truth, and were not satisfied until they had reached some direct intuition of the Light, the life in the cosmos. This started a new stream of thought. If they can do it, why can't I sit quietly and contemplate." There was no one nearby to help her. England in the 1920s had not even heard of meditation. Christmas Humphreys, a judge and scholar, opened the first Buddhist Society in 1926, at Eccleston Square, London, based primarily in Zen. The Theosophists had thought about things Buddhist, but nothing had percolated through to provincial libraries, schools, or homes. Freda was not only sincere, she was extraordinarily determined -- unusual traits for a girl that young. "The only thing I could think of was to go to church when nobody was there. I used to slip away from home in the early hours before school, sit alone in the pews, and just wait. There was always a prayer in my heart to reach God, or whatever you call that power or love beyond thought. I was only deeply interested in what I could find out from direct, intuitive understanding." She had taken the first step of the spiritual seeker, setting out on a journey that was to last nearly forty years, when she eventually found the path that she was looking for. In the meantime she kept her head in books. There were hints in her choice of reading of where she was heading. "Whenever anything from the East came into my hands -- poetry, literature of any sort -- there was always more than an ordinary depth of response," she said. Bedi studied for an MA in philosophy, politics and economics (PPE) at St Hugh's College, Oxford University. She met her husband Baba Pyare Lal "BPL" Bedi, an Indian from Lahore, on her PPE course. He was a Sikh from the Bedi family, linked to a Sikh clan tracing back to Guru Nanak Dev Ji. Romance blossomed and they married at Oxford Registry Office in June 1933, in spite of the reservations of her family and disciplinary action by her college. Whilst at Oxford she became an opponent of Empire and attended meetings of the Oxford Majlis, where nationalist-minded Indian students gathered, as well as of the communist October Club and the Labour Club. At St Hugh's her closest friends included Barbara Castle, later a prominent Labour cabinet minister, and the broadcaster Olive Shapley. All three women graduated with a third-class degree; Freda's husband got a fourth-class degree. "It was a very quiet little student who came up to St. Hugh's and wore the long exhibition gown to the lectures," Freda conceded. Oxford opened the doors of the world to her. At St. Hugh's she drew to her a small group of girls who were to go on to become some of the most powerful figures of their time. They stayed friends for years. From this time on, Freda was to mingle effortlessly with the great and the good from all cultures and ways of life. 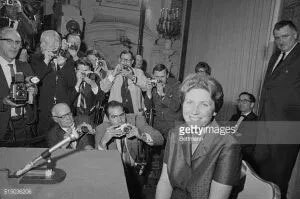 Leading the pack was the inimitable, feisty Barbara Betts, later better known as Barbara Castle, the first woman to become First Secretary of State under Prime Minister Harold Wilson, and hailed as one of the most important Labor politicians of the twentieth century. She was a major influence on Freda's life, steering her away from her provincial upbringing into an infinitely bolder, more sophisticated life. "Barbara brought with her a flavor of the north of England, where I was brought up, as well as the sturdy atmosphere of the great pioneers of English socialism," commented Freda. There was also Olive Salt Gorton, who became a pillar of the BBC and broke down class barriers by introducing regional accents to the airwaves to balance the clipped tones of "received pronunciation." "Olive brought the people of England into the BBC with programs like 'Underneath the Arches.' She took the microphone onto the pavements." And there was Olive Chandler, whom Freda was particularly fond of and with whom she maintained a lifelong correspondence: "She was a quiet little nun of a girl with a dove-like quality who was like my good conscience. When she saw me getting too excited with outside activities, she used to bring me back to my books and look after me." She joined just about every society, from the League of Nations to the Ornithological Club. "My belief in the charter of human rights was very strong, so that I saw Marxism not as a cheap political stunt, but in a deep,direct way." Freda rapidly learned German in order to be able to read and study Hegel, Marx, and the German philosophers in the original. Her spiritual life was not forgotten, however, and was running smoothly along parallel lines. Every Sunday she went to church to take Communion and would pop into chapel if there was Bach concert. Any hint of Eastern thought drew her like a magnet. She devoured "The Light of Asia," subtitled "The Great Renunciation," by Sir Edwin Arnold -- an epic poem describing the life of Prince Siddhartha, who became the Buddha. And she rushed to attend a lecture by Rabindranath Tagore, the Bengali Nobel Prize-winning poet, philosopher, songwriter, and educator, and was immediately entranced. Initially the glue was their shared admiration of communism and socialist ideals, so fashionable among the Oxbridge intellectuals of their day, who were eager to build a better, fresher world after the devastation of World War I. Cambridge, in particular, became a famous, well-documented breeding ground for communist gentlemen spies. Revolution was in the air, first in Russia then in China, overthrowing the old order, making way for the new. It was exhilarating. The Suffragettes were on the march too, chaining themselves to rails, throwing themselves under horses, and going on hunger strikes to obtain equal rights with men. The atmosphere was electric. It was not only politics over which they bonded; they also found affinity in their spiritual orientation. Oxford, with its intellectual liberalism and vast library, provided Freda with a wider scope of religious inquiry. Hearing Gandhi and Tagore and listening to BPL opened her up to Eastern beliefs. Her spiritual horizons were broadening considerably. "I decided completely that my search for Truth was beyond the Church, beyond Christianity even. By now I had become conscious of all the religions in the world. At Oxford, I realized I wanted to follow the path of the seeker, and the path of the meditator," she said. BPL understood that. Although he belonged to the Sikh Guru family, he himself was not orthodox. "He did not attach himself to any particular religion, but to all gurus and those who believe in deeper truths. This of course included his devotion to his ancestor, Guru Nanak, which was very great." At one point, Freda showed him a drawing she had done when she was seven. "You've drawn the Lord Buddha," BPL told her. He later added, "It explained why she was drawn to India, and why she fit in so well, and her great attachment to Buddhism in the latter part of her life. Everything that happened to her was the inheritance of a past life. Her karma was there from the very start." After a year in Berlin where B.P.L. Bedi was studying - and where the first child was born - Freda, her husband and baby son sailed to India in 1934. 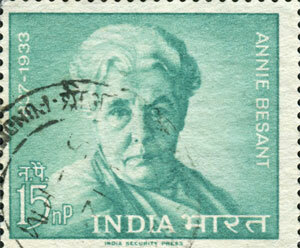 In 1931 [Annie Besant] became ill in India. 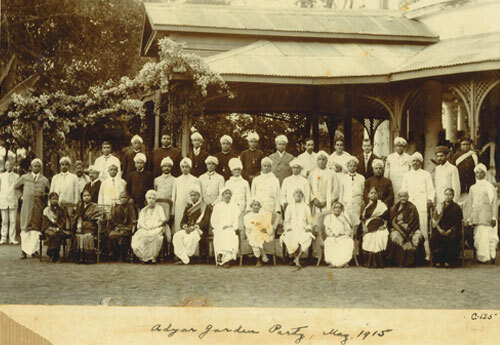 Besant died on 20 September 1933, at age 85, in Adyar, Madras Presidency, British India. Her body was cremated. Freda married BPL on June 12, 1933, at the Oxford Registrar’s Office. She was twenty-two and he was twenty-six…. Their creative, radical Oxford days were over. Both Freda and BPL received their degrees and a whole new life beckoned. It was not what Freda had imagined. She had successfully lined up a job as a cub reporter on the Derby Telegraph, her first stepping stone to Fleet Street (as she had intended). Instead she went to Germany with her new husband, who had won a Humboldt scholarship at the Friedrich Wilhelm University in Berlin, to research a PHD in Political Science. “Bedi was concerned about the rise of Hitler, but he thought that as long as he didn’t get a chance to rant in Parliament, it would be all right. He was going to keep a very keen eye on the situation,” she said. She was not to see her homeland again for fourteen years…. By the time Freda reached Berlin, she was pregnant, and delighted with the prospect of motherhood. BPL somewhat protectively decided that she should not work, but instead live quietly in the charming little cottage they had found on the bank of Lake Wannsee. “It was really a lovely place, with a beautiful garden, and we had some very happy months there preparing for the child,” she said. She busied herself with making baby clothes, but could not resist going to Berlin University to study Hindi with a Punjabi professor – a necessary preparation, she thought, for a life on the subcontinent, and to counteract the full-on domesticity she found herself in…. BPL refrained from any political activity in Germany, although he was keeping up-to-date with the Free India movement in India. A frequent visitor to their lakeside cottage was Subhas Chandra Bose, who went on to become one of the most prominent and controversial leaders of the independence movement. 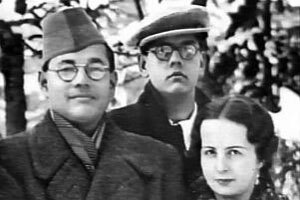 Bose was educated at Cambridge and also had a European wife – Emilie Schenkl, an Austrian. He made it a point to visit sympathetic Indian students living in Europe, and the couple had much in common with Freda and BPL Bedi. On May 13, 1934, Freda gave birth to a son after just a four-hour labor….They named him Ranga after the Indian statesman who had defeated the political opposition to their marriage, ten months previously…. BPL had not joined any political club at Berlin University, nor was he taking part in any political activities, but he sensed that tension was mountain. He was friendly with many of the Indian students living in the International Houses, which were being increasingly dominated by Nazi representatives. This peculiar linking-together of opposites -- knowledge with ignorance, cynicism with fanaticism -- is one of the chief distinguishing marks of Oceanic society. The official ideology abounds with contradictions even when there is no practical reason for them. Thus, the Party rejects and vilifies every principle for which the Socialist movement originally stood, and it chooses to do this in the name of Socialism. It preaches a contempt for the working class unexampled for centuries past, and it dresses its members in a uniform which was at one time peculiar to manual workers and was adopted for that reason. It systematically undermines the solidarity of the family, and it calls its leader by a name which is a direct appeal to the sentiment of family loyalty. Even the names of the four Ministries by which we are governed exhibit a sort of impudence in their deliberate reversal of the facts. The Ministry of Peace concerns itself with war, the Ministry of Truth with lies, the Ministry of Love with torture and the Ministry of Plenty with starvation. These contradictions are not accidental, nor do they result from ordinary hypocrisy; they are deliberate exercises in doublethink. For it is only by reconciling contradictions that power can be retained indefinitely. In no other way could the ancient cycle be broken. If human equality is to be for ever averted -- if the High, as we have called them, are to keep their places permanently -- then the prevailing mental condition must be controlled insanity. Inspired by the suffragette movement and Marxism (which was against the exploitation of anybody), Freda was in the vanguard of the feminist movement, long before the term even existed. "Being a socialist in India is no joke. We all of us live on the edge of jail, and however careful you are, nothing much can be done if you do get arrested, since legal rights are rather pre-Cromwell. It is very difficult to present a picture of these terrifying days," Freda wrote to Olive. "They even questioned the sweepers to see if she was teaching sedition! Once, when a sweeper was taken down to the police station and manhandled, my mother marched off with me in tow and took the police inspector to task. She then insisted on making a notation in the complaint book. That evening a British police officer visited the college and threatened to arrest her. She wrote to the police hierarchy in Lahore and sent copies to the newspapers. Mummy was absolutely fearless at all times!" Now unable to live independently in The Huts because it was too dangerous, she got permission to move into one of Fateh Chand College's hostels, taking Ranga with her. Children were not allowed into the hostels, but Freda was popular with students and staff alike, having won their admiration and respect. Again, the college bravely agreed. With plenty of staff only too happy to look after (and spoil) Ranga. Freda was free to continue her full teaching program and carry on with her own revolution. After a short while we were escorted to the commandant, a strapping British colonel whose discomfiture was even greater than that of his juniors. He said he could not allow the visit without confirmation from headquarters. Furthermore, he continued, providing accommodation for a difficult prisoner's wife and child or acquiring transport to the nearest town was out of the question. He didn't know what to do with us. We could see he was rattled and confused! At sundown he relented and conceded that we could stay in the officers' suite and would be able to meet Papa the next morning, at nine, for one hour. In the end we were given the VIP treatment, including an invitation to dine in the officers' mess hall. Mummy politely declined." After fumbling in his defense of India rules book the judge handed her the sentence: six months' rigorous imprisonment in Lahore female jail. Her "hard labor" was not hauling bricks or smashing rocks but working in the prison garden from 8:00 a.m. until noon, and again from 1:00 to 5:00 p.m. Of all punishments, nothing could have suited nature-loving Freda better. It was a godsend. She set to work tilling the soil, tending the fruit trees and vegetables: marrows, cucumbers, onions, okra, lemons, mangoes, and mulberries. Surrounded by plants and birds, the mystical Freda was often "transported" beyond the prison walls. Her diary records how entranced she was by the early hooting of an owl, the tenderness of a pair of parrots making love, the crows flying purposefully home. And when the garden bloomed, she became positively ecstatic. By May, Freda began to hear whispers that legal moves were afoot to get her an early release. It was true. A certain Justice Bhide gave an enterprising judgment in the High court that claimed that sending a letter to a magistrate announcing one's intention to break the law (as Freda had done) did not constitute an offense in itself. In fact, he argued, it was a prevention of a crime! Over the next few days, the news became more certain. On May 23, Freda was informed that she was to be released the very next day, triggering a round of farewell parties from the other inmates, who were sad to see her go. Within an hour dozens of relatives, accompanied by others, began to descend. The next morning it got worse -- hundreds of bullock carts laden with families and villagers arrived for darshan (blessing). It was decided that another platform should be built outside the gate, where Mummy could sit and bless the people. For two days people filed past -- and then on the fourth and final day Mummy was taken around the village on a bullock cart." 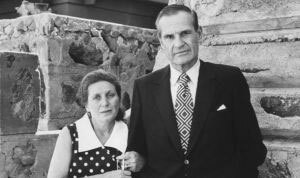 Shortly after her release, Freda heard rumors that her husband was being moved from Deoli, because the detention camp was being prepared for prisoners of war. It was thought that BPL was going to be transferred to another prison, but much to the family's amazement, he simply walked into Dera Baba Nanak one evening. The same victory parades that had regaled Freda's return were now staged for BPL, but this time the couple stood on the bullock cart side by side. She worked as a journalist and taught English at a women's college, and with her husband published a high quality quarterly review "Contemporary India". Both were leftists and campaigning nationalists active in India's independence movement. "Baba" Bedi spent about fifteen months in a prison camp in the early stages of World War Two. Freda herself was detained for a shorter time after deliberately defying the wartime regulations as part of a civil disobedience campaign spearheaded by Mohandas K. Gandhi as a satyagrahi. In 1947, Bedi and her family moved to Kashmir, where husband and wife were influential supporters of Sheikh Abdullah, the left-wing Kashmiri nationalist leader. She joined a women's militia for a while and taught English at a newly established women's college in Srinagar in Kashmir. Later in Delhi, she became editor of the magazine "Social Welfare" of the Ministry of Welfare. She briefly served as a member of the United Nations Social Services Planning Commission to Burma, during which she was first exposed to Buddhism, which quickly became the defining aspect of her life. In Rangoon she learned vipassana from Mahasi Sayadaw, and Sayadaw U Titthila. In 1959, when the 14th Dalai Lama arrived in India along with thousands of Tibetans, she was asked by Jawaharlal Nehru to help them and spent time improving facilities for refugees at camps in Assam and West Bengal. She became an observant Tibetan Buddhist and she followed the guidance of the 16th Karmapa of the Kagyu School. She worked with the Dalai Lama to establish the Young Lamas Home School. Bedi set up the Young Lama's School in Dalhousie to train young Tibetan monks, a number of whom became well-known teachers, including Chogyam Trungpa, Thubten Zopa Rinpoche, Akong Rinpoche, Tulku Pema Tenzin, Gelek Rimpoche, Lama Yeshe Losal Rinpoche, and the sons of Tulku Urgyen Rinpoche, Chokyi Nyima and Chokling of Tsikey). In 1963, with Lama Karma Thinley Rinpoche and under the guidance of the Karmapa, she founded the Karma Drubgyu Thargay Ling nunnery for Tibetan women, now located in Tilokpur, Kangra Valley. 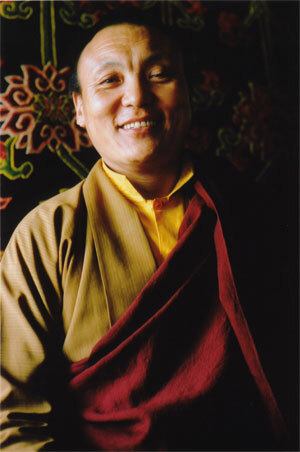 While running the Young Lamas Home School at Dalhousie in north India, Bedi also spent time at Rumtek in Sikkim, the seat of the Karmapa in exile. In 1966, she took sramaneri ordination by the Karmapa, and was given the name Gelongma Karma Kechog Palmo. She was one of the first Western women to take ordination in Tibetan Buddhism. In 1972, she took full bhikshuni ordination in Hong Kong - the first western woman to do so, and according to the scholar Hanna Havnevik possibly the first woman in the Tibetan tradition to receive this higher ordination. 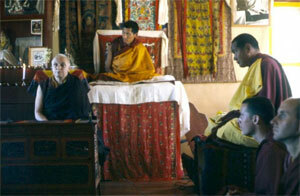 She accompanied the Karmapa on his first visit to the West in 1974, a five-month tour across North American and Europe. She was a Tibetan–English translator. They arrived in India traumatized, starving, ill, filthy, and utterly disoriented. Their escape to freedom had been pitted with unimaginable horror -- snow, ice, crevasses that suddenly opened up under their feet, and Chinese troops who shot on sight. They had seen many of their countrymen lose their lives. Not sure what to do with this great influx of lost, battered humanity, Nehru sent for the one person whom he knew was qualified to help: Freda Bedi. Nehru knew from firsthand knowledge that she had handled the refugee crisis in Kashmir after Partition with consummate skill, was an excellent administrator, and furthermore was currently engaged in social work throughout the subcontinent. He'd also heard she had a newfound affinity with Buddhism. He duly appointed her adviser on Tibetan refugees in the Ministry of External Affairs. She readily agreed. There was also the matter of reincarnation itself, which in the predominantly Christian West was still regarded as heretical. People had been burned at the stake and been killed en masse (such as the Cathars) for believing such anathema. In the 1960s and 1970s reincarnation was still a taboo subject. The Tibetans, however, not only completely accepted reincarnation as a given fact of life, they went farther than any other Buddhist country by devising a system to find specific rebirths of accomplished spiritual masters who had forsaken higher states of consciousness after death in order to be reborn in an earthly body solely to continue to teach others how to reach the same exalted state they had achieved. The voluntary return to this vale of tears was seen as the highest mark of altruism, brave and noble beyond measure. These were the tulkus, titled rinpoches, or "Precious Ones." They were the cream of Tibetan society, revered, feted, and sometimes unwittingly used as pawns in others' games of corruption. These were the people Freda was now planning to bring to the West to plant the seeds of the Buddha's teachings into American, European, and Australian soil for the first time. 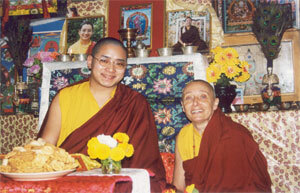 Gelek Rinpoche was another frequent guest at the Bedi household. A highborn reincarnate lama related to the Thirteenth Dalai Lama, Gelek Rinpoche was found by Freda in the Buxa refugee camp, plucked out, and taught the niceties of how to behave in Western society, Professor Higgins-style. "I stayed with Mummy and her family on and off for about three years. Trungpa and Akong were already living with her. Trungpa was very diligent, but I was lazy. I felt I was on holiday! Mummy Bedi helped me get over my monk's superiority complex. She also taught me to respect women and other people in general. "Her intention was to teach me about life outside my small monastic world. I was completely unaware of anything other than Tibetan life. She taught me to speak proper English. 'Don't run your words together, say them separately,' she'd instruct. Mummy would also take me to social events such as diplomatic parties. She would literally take me by the hand and show me how to enter a room, how to behave, and what to say. 'If you do not know the person, you put out your hand and say, slowly, "How do you do, how lovely to meet you.'" Sometimes we acted out these scenes with her husband and two children, Kabir and Guli, as the audience. Another woman who experienced Freda's ability to break down barriers to get what she wanted was Joanna Macy, renowned American environmentalist, teacher, and author. She was living in Delhi with her husband [Francis Underhill Macy], who was working for the Peace Corps, when Freda came to visit. "I remember I opened the door and she stood there in her maroon clothes, greeting me as if somehow I and not she were the guest. I loved the way that touch of the Raj blended so paradoxically and superbly with the monk's garb she wore. She had come because she wanted my husband to release a particular person in the Peace Corps to work for her in Dalhousie. 'I shall speak to my friend Mr. B in the Cabinet,' Mummy said with a smile. 'When do you think we can expect him?' It was the marriage of serenity and sheer nerve. She was English in the way only the English can be. She had implicit authority," Macy said. He got involved in nuclear issues after the 1986 Chernobyl disaster, which occurred while he was in Russia. In 1995 he founded the Earth Island Institute's Center for Safe Energy, which has trained hundreds of activists in Russia, Ukraine, Georgia and Kazakhstan. Later, Macy went to Dalhousie to help settle Khamtrul Rinpoche, a high lama who had escaped from Tibet with a huge number of followers, including monks and a large community of accomplished artists and craftspeople. She took the opportunity to take teachings from Freda at a small class for Westerners she had organized in Dalhousie. Macy also undertook a silent retreat under Freda's direction, and today acknowledges Freda's influence on her spiritual life. Single-handedly Freda had already set the scene for Buddhism to make the historic leap from East to West when she had the foresight to establish the Young Lamas Home School. In 1972, the year of her full ordination as a bikshuni nun, she took another momentous step in that direction by personally agreeing to take the Buddha's message to South Africa, the first of several overseas "missions" she undertook. Hr journey there was significant not least because it revealed the full extent of the spiritual authority invested in her by the Karmapa, as well as the scope of the knowledge and personal realizations that she had attained in her relatively new religious path. 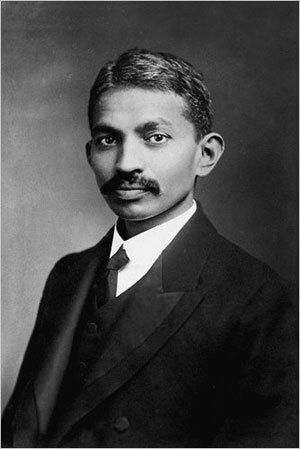 Mahatma Gandhi: "Yes," he replied "When in South Africa I worked with Major Peacock in the building-up of the Theosophical Movement. I am still a Theosophist but I am not in sympathy with the Movement. I am not in favor of any institution which fosters secrecy. Illustrating her point about the readiness of America to accept Buddhism, she gave a White Tara initiation (the female Buddha of Compassion in Action) in New York, which was simultaneously broadcast on local radio. It was an unprecedented break with tradition and a real entry of Buddhism into modern Western life. Through the airwaves Freda's voice rang out: "Visualize enlightenment in the form of the Holy Mother, in order to receive all the blessings," she said. "The mind is a tremendous thing. If we can remove the veils, the obscurations, we can see the mirror-like quality of its pure state," she continued. "The Divine Mother helps us calm our minds and brings us the blessing of transcendental knowledge. She also increases life and gives us more energy." She went on to explain further the esoteric meaning behind Tara: "Tara comes in twenty-one basic forms, whose primary functions are to remove all fears. There is a multiplicity of forms, but in fact there is just one. All is Buddha, all is Divine Mother. It's like fragmentation of light into prismatic colors." BOY, WHAT A FUNNY PLACE TO GET ATTACHED! THEY ALL SAY THE SAME THING! Bedi died in New Delhi on 26 March 1977. She was survived by two sons, Ranga Bedi, who was a tea planter, and Kabir Bedi, a Hollywood and Bollywood film and TV star; and a daughter, Gulhima, lives in the United States. A fourth child, Tilak, died in infancy. •	Ein Rosenkranz von Morgengebeten : nach der Tradition des Mahayana – Buddhismus / aus dem Tibetischen ins Englische übers. von Karma Khechog Palmo. Deutsche Wiedergabe von Advayavajra. – Almora, Indien : Kasar-Devi-Ashram-Publication, 1971. – VI, 49 S.
1. Chodron, Thubten. "About The Issue: The Present Status of the Bhiksuni Ordination". Committee for Bhiksuni Ordination. Retrieved 2018-06-04. 2. "The British woman who fought for India's freedom". 7 March 2019 – via http://www.bbc.co.uk. 4. "From Oxford to Lahore — the anti-imperialist Briton who became a Tibetan Buddhist nun". Oxford Today. 31 May 2017. 6. "GELONGMA KARMA KHECHOG PALMO". http://www.luxlapis.co.za. 7. Andrew Rawlinson, op. cit. "In 1952 she went to Rangoon and practised vipassana with Mahasi Sayadaw (Friedman, 276), one of the first Westerners to do so. She also practised with Sayadaw U Titthila (Snelling, 321). " 10. Jamyang Wangmo, The Lawudo Lama: stories of reincarnation from the Mount Everest region p. 191 : "The Young Lamas Home School started in Delhi in 1961 in the house of Frida Bedi, with Chogyam Trungpa Rinpoche, Akong Rinpoche, Tulku Pema Tenzin Rinpoche, and Geleg Rinpoche as the first students. After a while, Mrs. Bedi rented a beautiful new house at L-7, Green Park, in the Hauz Khas area of New Delhi. When I joined the school in 1962 there were twelve tulkus attending." 11. Kunsang, Erik Pema (18 September 2005). "Blazing-Splendor: Young Lamas Home School in Dalhousie". 13. "Free Ebooks PDF, ePub, Mobi Directory - http://www.tilokpur.org". http://www.tilokpur.org. 17. Hanna Havnevik, Tibetan Buddhist nuns: history, cultural norms, and social reality, 1989, p. 88 "Freda Bedi died in New Delhi on the twenty-sixth of March 1977." •	Havnevik, Hanna (1989). Tibetan Buddhist Nuns: History, Cultural Norms and Social Reality. Oxford University Press. p. 251. ISBN 978-82-00-02846-8. •	Wangmo, Jamyang (2005). Lawudo Lama, Stories of Reincarnation from the Mount Everest Region. Wisdom Publications. p. 434. ISBN 978-0-86171-183-3. Before we continue with Roy’s saga in India we need to talk of the highly interesting phenomenon of the Western women participating in Indian independence struggle and in the leftist revolution as also getting involved with Asian men. It is one the fascinating aspects of the early decades of the twentieth century. Such involvement of Western Women with men from their colonies and in matters that they considered detrimental to their mother-countries became a source of irritation and embarrassment to the European powers, especially to Great Britain. Kumari Jayawardena in her Book The White Woman’s Other Burden: Western Women and South Asia during British Rule has written wonderfully well on this very engaging subject. Much of what is said here is based on her Book. The British did not mind so long as the British women confined their activities to social issues such as education, health, charity, social reform and such other harmless activities. They could tolerate it as facet of women’s motherly nature. And, their caring for the weak, oppressed, downtrodden and a general concern for the deprived were viewed as giving expressions to virtues of Christian charity. The British authorities, either in Britain or in India, were not unduly worried about such pious preoccupations of their women as long as there was no breach of law and accepted norms of conduct. White women as Theosophists were more daring in their questioning of the accepted ethnic and gender roles; and British did not relish the sight of their women of superior race and class wandering behind their Indian Gurus and singing their virtues and greatness. Though such women, surely, were annoying, they were not considered dangerous. But, a more serious worry, anxiety and threat were the Western women socialists and communists. They were an anathema to the British rulers. Such impertinent women were viewed as the ultimate shame and embarrassment. On a more serious level they were regarded as serious threat to the colonial rule and to the security of the State. In some cases, severe threats, punishments and deportation were imposed on such erring women to prevent them from further engaging in activities that could harm British rule and British image. A close watch and scrutiny was kept on western women engaged in anti-colonial activities and entangled with Asian men. And, they would be arrested if there was a perceived breach of law. But, when the British and other western women were legally married to Indian men, their deportation would become a difficult and a ticklish issue. Because, in most cases the western women who got involved with Indian freedom movement or the leftist groups and with the Indian rebels, were, quite often, women coming from respectable middle class families. They usually were well educated having attended Universities and research institutions. They did not fall into the category of the run-of-the-mill ‘undesirable low class’ who could be put behind the bars routinely. Further, such women who got involved with Asian men and leftist/anti-imperial activities were not only an embarrassment to the white-race, but also were a greater threat to the white race and the State. Such white–educated women were looked down as treacherous traitors who brought shame and betrayed ‘white womanhood’. They were a more serious threat to the Empire than wayward men. Instead of helping the white men and their colonial rule these misguided women were undermining the very system that supported their life, their homes and their existence. Their unspeakable socialist views and their scandalous marriage, their illicit liaison with Asian men were despised as most reprehensible. They not only had gone astray but would also bring up half-breeds treading their dangerous path. The British Intelligence, therefore, kept track of the Indian revolutionaries and their western women. And, in fact there were quite a number of such most horrid pairs. The Western women – theosophists who claimed their rights as women to travel and follow their ‘faith’; and, the socialist women who came out to fight imperialism; formed the ‘feminist breakthrough’ by their rejection of the orthodox church and appropriation of alternative cultures and political ideologies. Such ‘reprehensible’ alliances also caused discomfort to the Officers of the Empire placed in the colonies. The British dignity in the colonies also depended on their women’s allegiance to the Crown, to colonialism ; and on their modest behavior as polite ladies of refinement and culture. The worst sort of women, for the colonialists, were those white women who ‘traitorously’ rejected the moral duty of imperialism and embraced Asian men and Asian nationalism; for, they were seen not only to reject Empire but also the British men. The British masculine pride in such cases would surely be hurt. Another irritating dimension of the British women marrying Indian men was the bringing up of their children according to Indian traditions and culture. That truly annoyed both the Colonial officers and the Church. The situation in Berlin, Germany, was slightly different. Here, relationship or living-together of white woman with Indian male did not suffer from the ‘betraying-the Crown–syndrome’; although there were other issues related to political ideology and criminality. Berlin in the 1920s and 1930s was the hub of Indian students and Indian intellectuals, as also of those diverse revolutionary groups, each fighting the British rule in India, in its own manner, Indian students, in Berlin, openly engaged in anti-colonial gatherings; creating anti-British alliances; and even forging ties with Communists. The line between academic studies and radical politics was often blurred. Most of the Indian students got involved in radical anti-colonial politics. A significant number of them on return to India grew into nationalist leaders. For instance; Dr. B R Ambedkar the doyen of Indian politics and the Social reform movement, for some time, studied Economics in the Bonn University during 1922-23. He was quite fluent in German (having taken it as a minor at Columbia University) and wrote his CV dated 21 February 1921 submitted to the University, in German. Please click here to view his hand-written CV, in German language. The other more well known of such caliber were: Dr. Zakir Hussain, who later rose to become the President of India; Dr. Ram Manohhar Lohia the stormy Socialist leader. And, Gangadhar Adhikari on return to India became the most influential theoretician in the Indian Communist Party from 1930s to 1940s. And, Dr. Meghnad Saha a noted physicist after returning to India played a major role as the nationalist organizer of science in India during 1930 to 1950. Apart from radical politics, many Indian students got involved with German women. The instances of Indian students marrying German woman are too many to be recounted here. Just to cite a few cases: the brothers Anadi Nath Bahaduri and Prashath Bahaduri who studied in Germany during the 1920s returned to Calcutta with their German wives Margrit and Gerta. Apart from that, Abdul sattar Kheiri, Babar Mirza, Benoy Kumar Sarkar, and M N Roy all had German or Austrian wives. It appears that during 1930s at least six professors at the Aligarh University who had earlier studied in Germany had German wives. But all such inter cultural marriages, as it usually happens, were not blissful or milk and honey. The relations within the marriage were tormented by inter-cultural differences, conflict of ideas and affiliations. The 1920s and 1930s were marked by ‘militant phase of feminism’. The western women that Virendranath Chattopadyaya and M N Roy came into contact had strong views on women’s liberation, both in the West and in India. They were quite eloquent in expressing their views. There were also differences on the political line taken by Indian men. The western women took their own theoretical positions on certain public issues, like birth control etc. Therefore, there were always passionate arguments. Even Roy had problems with Smedley. Her views on women’s rights particularly on the issue of abortion were more radical than that of any other Indian nationalist or reformers of 1920s. Many Indian communists living in the West tended to project their relation with western women or political-comrades as a sign of ‘progress’ and modernity. The Indian men as socialists took a ‘progressive stand on the question of women’s equality’; but, their practice in day-to-day life differed from their stated principle. Roy also spoke and wrote that the modernization of Indian women was a ’historic necessity’ to transform the traditional outdated institutions which deprived women of their elementary human rights. In theory and in public stand he was much ahead of the contemporary scene. But, in his personal life and in his relations with the women in his group he did not seem to differ much from the contemporary male culture. The lot of western women who married fugitive Indian men – perpetually on ‘run’, very poor, nervous and highly insecure – was truly pathetic. And they did suffer a lot –- physically, mentally and emotionally. They also had to endure the pain, and humility of escapades and displacements. To put it very mildly, for a Western woman, such marriage was a highly unrewarding experience, to say the least. ‘We were desperately poor, because Viren had no possessions. I sold everything I owned in order to get money… We skirted the problem by frequently moving, changing names. But, our debts and difficulties seemed to increase by geometric proportions. More than death, I feared insanity”. She suddenly left Viren in 1928. As for men, the strain of living as fugitives in a foreign land, without a sense of home, in a hostile environment was indeed very severe. Many Indian revolutionaries in West became nervous wrecks (e.g. 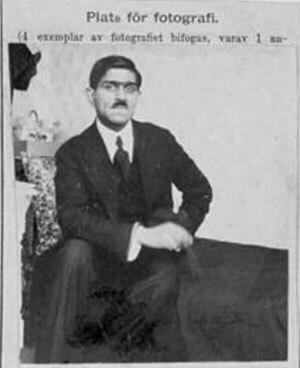 Lala Hardayal in Berlin). M N Roy and Virendranath Chattopadyaya fell seriously ill. Roy was affected with infection of the inner ear and severe stomach illness. Virendranath also suffered from varieties of stomach illnesses. In addition, he suffered from paranoia. It appears he never took the meal outside for fear of being poisoned. Virendranath‘s final wife, Russian, Lidilia Kazunovskala remembered him as ‘always in a state of fleeing, full of disease, sorrow, tension, always on alert’. Viren eventually left Berlin in 1928. After another year of wandering he settled down in Moscow for some years. But soon after Stalin’s program of purging started he became nervous again, because he came to know that he was being watched for his ‘deviations from ‘orthodox Marxism-Leninism’ in his talks. He was called an Indian nationalist and not a true Soviet. His worst fears were, sadly, proved right. 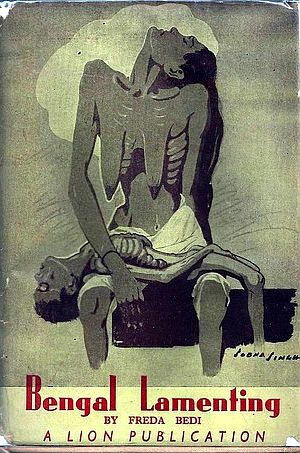 He was taken in Stalin’s purge of 1938-1940 and murdered. 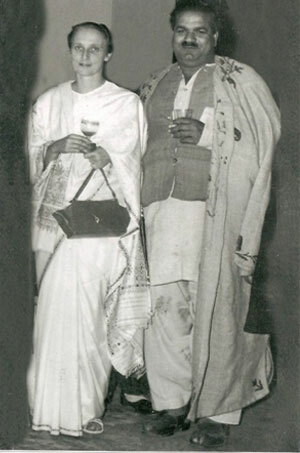 (a) Abani Mukherjee who was in M N Roy’s communist group was married to Rosa Fitingof, of Russian and Jewish origin. They had a son named Goga. Rosa Fitingof had joined the Communist Party in 1918; and was an assistant to Lydia Fotieva, Lenin’s Private Secretary when Abhani Mukherjee met her 1920. 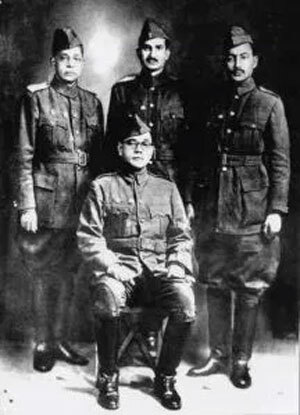 Fitingof and Abani Mukherjee were among the founding members of the Indian Communist Group formed at Tashkent. Later, she was also Roy’s interpreter. (b) Dr, Anadi Bahaduri was member of Roy’s group in Berlin and was studying there for a Doctorate in Chemistry. His wife Margrit (born in 1907) of German Jewish origin continued to live in Calcutta after Bahaduri‘s death, teaching German. 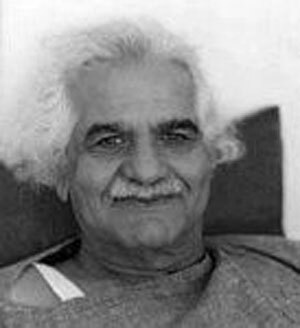 (c) Also in Berlin was Saiyad Abdul Wahid Abai, an Indian Communist who married a German Jewish woman Kaethe Hulda Wolf. (d) Another was Pandurang Sadashiv Khankhoje (1884-1966) from the rival group of Chattopadyaya. He was in the Ghadar Party in California; was named in the the Hindu-German Conspiracy; and, fled to Mexico in the early twenties (1920). He worked in the ministry of Agriculture in Mexico. He led the Mexican corn breeding program and was appointed Director of the Mexican Government’s Department of Agriculture. 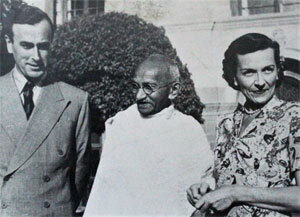 And, in 1936 he married a Belgian – Jeanne Alexandrine Sindic (born 1913).Both returned to India after independence. He settled down in Nagpur; and later went into politics. 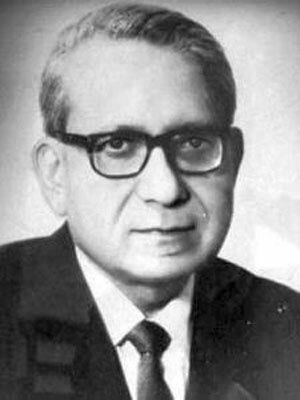 Pandurang Khankhoje died on January 22, 1967. (e) And yet another was the Punjabi leader Baba Pyare Lal Bedi (B P Bedi), an author and philosopher, and his English wife Freda Houlston Bedi from Derbyshire (daughter of Francis Edwin Houlston and Nellie Diana Harrison). Freda (5 February 1911 – 26 March 1977), by any account, had an unusual life. She was born in Austria; raised and educated in England (Masters from St. Hugh’s in Oxford ) and in Sorbonne, Paris; married a Sikh at Oxford in 1933; and, in 1934 went to live in India where she spent the rest of her life. Before they moved to India, Andrew Whitehead writes, Baba Pyare Lal and Freda Bedi spent several months, during 1933-4, in Berlin where Baba Bedi had secured a research post. Their first child was born in Berlin. And in the autumn of 1934, the Bedis and their four month old baby reached India. After they settled down in Lahore – India, both got busily involved in the national independence movement during the 1930s and 1940s. The Bedis also became involved in left-wing politics and in journalism. They published several books and edited India-Analyzed (1934). And later, while participating in the national freedom movement, Freda was arrested and detained in Lahore jail with her children and with Gandhi. She was in prison for about six months during 1941-42 . Her husband, Baba Bedi, it is said, spent long years (?) in prison for his activities in the struggle for independence. Baba Pyare Lal Bedi (1909–1993) later took to life of mysticism and spiritual healing. After release from prison, they moved to Kashmir. Freda became the Professor of English at Srinagar in Kashmir. Both Freda and Baba Bedi were active in Kashmir during the 1940s; and were said to be close to Sheikh Abdullah and the National Conference. Baba Bedi is said to have drafted the party’s distinctly radical ‘New Kashmir’ manifesto. The book is more than a cry of pain, a call to pity, a picture of another tidal wave of tears that has wrenched itself up from the ocean of human misery. It is a demand for reconsideration on a national scale of a problem that cannot be localized, a plea for unity in the face of chaos, one more thrust of the pen for the right of every Bengali and every Indian to see his destiny guided by patriots in a National Government of the People. After Independence, she edited Social Welfare, a magazine of the Ministry of Welfare; and was also appointed as the social worker of the United Nations Social Services, assigned to Burma. And much later, she was nominated as the advisor on Tibetan Refugees to the Ministry of External Affairs, Government of India. In 1952, while working for the United Nations, Freda went to Rangoon; and, there she was drawn to Buddhism, learnt Vipassana meditation with Mahasi Sayadaw and Sayadaw U Titthila. Freda was one of the first Westerners to be initiated into Vipasana. 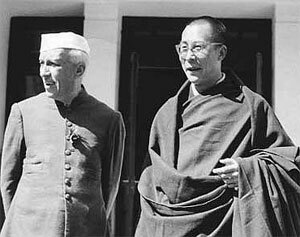 Then in 1959, when the Dalai Lama arrived in India along with thousands of Tibetans, Nehru asked Freda Bedi to help settle them; and, he then put her in charge of the Social Welfare Board. Freda was very drawn to Tibetan Buddhism and spent the rest of her life as a leader who looked after the welfare of Tibetans in India. And simultaneously, she took to practicing Tibetan Buddhism of the Kagyu School under the direct guidance of the Karmapa. She also became the Principal of a school established by the Dalai Lama in Delhi for young Tibetans. In 1963, Freda helped in setting up Karma Drabgyu Thargay Ling, a nunnery for Tibetan women in northern India. Besides, she set up a number of other organizations, such as : Friends of Buddhism, New Delhi; Tibetan Friendship Group; Young Lama’s Home School, Dalhousie; and Mahayana Monastic House. In 1966, Freda was ordained as a Buddhist monk by the Karmapa; and, was given the name Gelongma Karma Kechog Palmo or Sister Palmo. She was the first Western woman to be ordained in Tibetan Buddhism. She was in contact with the Tibetans right from the moment they arrived in India; guiding and helping them in several ways. She arranged for education of number of young Tibetans in UK. Sister Palmo was a ‘Mother-figure’ ; and, was affectionately addressed by Tibetans as ‘Mummy’. It is said; Sister Palmo was uniquely influential, in a quiet way. She became an adept in Western Tibetan Buddhism; became a Dharma teacher; and guided many disciples. As an ordained monk, Sister Palmo undertook several tours to West covering Britain, Europe, U.S.A. Canada and South Africa lecturing, giving Dharma instructions and initiations. She also supervised the activities of the Tibetan Buddhist centers set up in Scotland, USA and other places. In her efforts to spread the message of the Dharma, during her tours, she met and discussed with several leading thinkers. During her tour of 1974-5, she visited the Vatican and met the Pope. She also turned into a Tibetan-English translator; translating number of Tibetan woks and hymns into English (the language ‘my birth-land’ – as she said). Her translations of A Garland of Morning Prayers – in the tradition of Mahayana Buddhism; and other prayers are quite well regarded. Please also check : http://www.luxlapis.co.za/tibet.html for more. In the later part of her life, she moved to a retreat in Sikkim, took to meditation intensely; wrote, and initiated and guided a spiritual movement that later became the ‘New Age’ movement. Freda Houlston Bedi – Gelongma Karma Kechog Palmo was indeed an extraordinary person who lived an active and a purposeful life in the service of her fellow beings. She excelled in all the aspects of her life. And, in that she found her fulfillment. She died peacefully in New Delhi on 26 March 1977, at the age of 66. The Venerable Gelongma Karma Kechog Palmo (Freda Bedi) is revered as almost a Saint in Tibetan Buddhism. According to Ms. Swati Jain, a Stupa is erected in Memory of Freda Bedi (Sister Palmo) at the Palpung Sherabling Monastic Seat in Bhattu, Kangra District, Himachal Pradesh. 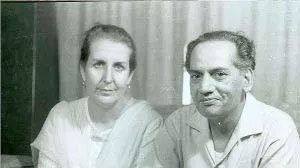 (f) Another couple in the left politics was the famous Urdu poet Faiz Ahmed Faiz of Lahore and his wife Alys George (September 22, 1914 – March 12, 2003) the daughter of a London bookseller. She and her sister Cristobel were active in leftist circles during the 1930s; and, both had worked with Krishna Menon in the India League at London. Her sister married Mohammad Din Tasser of Lahore (also in left movement). On a visit to India, Alys met and married Faiz and worked in politics and journalism. She was the founding member of the Democratic Women’s Association. He died in 1984. She continued to live in Pakistan as human rights activist. (g) But the most sensational of all such relations was that of an early associate of M N Roy and the one who financed Roy’s health care in Switzerland as also his trip to India. He was Raja Brajesh Singh a wealthy prince hailing from the royal family of Kalakankar near Allahabad; and an Indian Communist. His affair with Josef Stalin’s daughter Svetlana became sensational. 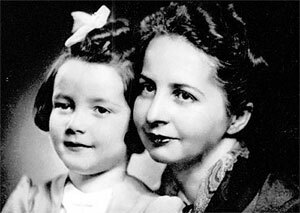 Svetlana Iosifovna Alliluyeva (later known as Lana Peters), was the youngest child and only daughter of Soviet Premier Joseph Stalin and Nadezhda Alliluyeva, Stalin’s second wife. Svetlana, when she was 17, married (in 1943) Grigory Morozov, a fellow student from Moscow University, though Stalin hadn’t liked it. They had a son Josef (Iosif) in 1945. And, their divorce took place in 1947. 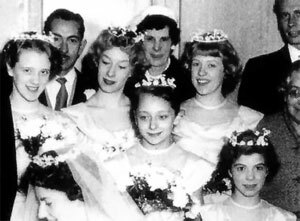 Svetlana married, for the second time (in 1949), Yuri Zhdanov, the son of Stalin’s close associate. A daughter, Katherine, was born to them in 1950. And, soon thereafter they were divorced. Josef Stalin died in 1953. In 1963, while Brajesh Sing was recuperating from bronchitis in Sochi, Russia, by the side of the Black Sea, he met Svetlana. The two began to talk about a book by Rabindranath Tagore that Svetlana had found in the hospital’s library. Singh was the most peaceful man Svetlana had ever met. He protested when the hospital wanted to kill the leeches they had used in his treatment, and he opened windows to let flies escape. When she told him who her father was, he exclaimed “Oh!” and never mentioned it again. By then, Brajesh Sing had already married twice – to Lakshmi Devi and to Leea, an Austrian woman. When they met in 1963, Svetlana was about 37 years; and Brajesh Singh (said to be old enough to be her father) was about sixty, about twenty-three years elder to Svetlana. It is not clear whether they were married formally. It appears that the Soviet Primer Alexi Kosygin had strongly disapproved of Svetlana getting married to Brajesh Singh. (She however persisted in calling herself as Brajesh Singh’s wife.) 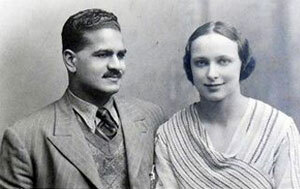 They lived together for four years as man and wife at Sochi until Brajesh Singh died on 31 October 1966. Svetlana ensured that Brajesh Singh was cremated according to Hindu rites. Thereafter; she decided to take his ashes to India for immersion in the Ganges. That took time because the Soviet leaders tried hard to dissuade her from making that journey. Finally, the arrangements for her travel to India were made at the highest level. And, that was not difficult since Brajesh Singh’s nephew Dinesh Singh was a confidant of then Prime Minister Indira Gandhi and was also a member of her council of ministers. Svetlana arrived in India on 20 December 1966 with ashes of Brajesh Sigh. She stayed with Brajesh’s family at their ancestral royal home at Kalakankar near Allahabad (UP). After a couple of days, on 25 December 1966, Brajesh’s ashes were immersed in the Holy Ganges, with Svetlana watching the ritual, from the shore, dressed in widow’s white sari. She lived happily with Brajesh’s extended family; and got on very well with all its members. She wanted to stay back in India; and, Brajesh’s family was also willing and happy to let her stay with them. Svetlana asked Dinesh Singh (Brajesh’s nephew) to use his influence with Indira Gandhi to let her stay in India. But the Soviet Government insisted that she should be back in Moscow before the end of March 1967. Indira Gandhi, not daring to antagonize the Soviets, advised Svetlana, through Dinesh, to return to Russia. Exasperated, Svetlana approached socialist Rammanohar Lohia in Allahabad for help so that she could stay in India and build a memorial for Brajesh. He promised to help; but could do very little. 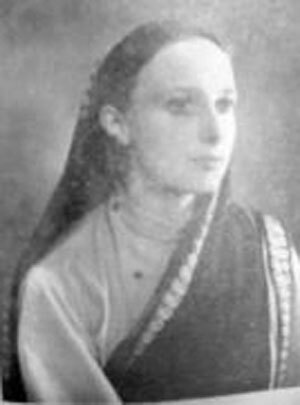 Svetlana then reached New Delhi for making arrangements for her travel to Moscow; and stayed there at the Soviet Embassy where Ambassador Nikolai Benediktov was advising her to return home. Next day, on the evening of 6 March 1967, Svetlana went out to finalise her travel arrangements; but, she asked the taxi to drive straight to the American embassy. The embassy had shut for the day. She told the duty officer who she was and what she wanted. In panic, the duty officer rang up Ambassador Chester Bowles and told him that he must come to his office immediately to deal with a matter that could not be discussed on the phone. Mr Bowles arrived, talked to Svetlana and gave her a lined pad to write down why she wanted to go the US; and, not to her own country. According to the Ambassador’s subsequent account of the incident, as he had expected, there was not a word from Washington by the deadline. So he arranged to send Svetlana to the airport in the company of a CIA officer to catch a flight to Rome. Only after she had reached Rome safely did the sensational news of her dramatic great escape was leaked to the Press. There was, of course, a huge uproar in Moscow and in New Delhi; the US government blandly explained that it merely helped Svetlana on humanitarian grounds. smiles for photographers at her press conference April 26. The note that Svetlana wrote while in the US Embassy at New Delhi along with her “Twenty Letters to a Friend” was published within months of her arrival in the US; and it became a best-seller. The book in the form of a series of letters to her friend, the physicist Fyodor Volkenstein, described her family’s tragic history. The message of the book, it seemed, was that being one of Stalin’s relatives was nearly as terrible as being one of his subjects. According to Brajesh Singh’s family in India, Svetlana did not forget her commitment for the memorial for Brajesh: “She kept sending money for many years for a hospital in Kalakankar village in Brajesh’s name, until it was taken over by the government”. Svetlana settled down in Princeton New Jersey, where she lectured and wrote. 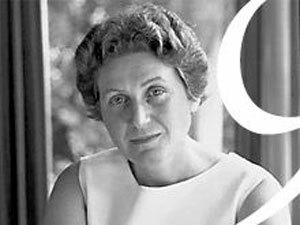 From 1970–73, she was married to American architect William Wesley Peters with whom she had a daughter, Olga. Svetlana died in Richland Center, Wisconsin, U.S, from complications arising from colon cancer, on 22 November 2011, at the age of eighty-five (28 February 1926 to 22 November 2011). My Friend, Stalin’s Daughter by Nicholas Thompson which appeared in the March 31, 2014 Issue of The New Yorker. Let’s talk about the intertwining lives of what was called as the Left Quartet – M N Roy, Evelyn Trent, Virendranath Chattopadyaya and Agnes Smedley, in the subsequent parts. Freda Bedi, born in 1911 in England, lived a “big” life. She attended Oxford University, where she met and married Baba Pyare Lal Bedi, who was the sixteenth direct descendant of Guru Nanak, founder of the Sikh religion. They moved to India in 1934 and were active in the Indian national independence movement; she was one of Gandhi’s handpicked satyagrahis. 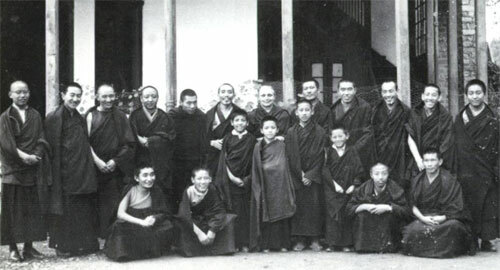 Bedi later played a significant role in providing support to some of the first Tibetan Buddhist lamas to teach Westerners, primarily through the Young Lamas Home School, which she established in 1960. Lama Zopa Rinpoche was one of the many young tulkus who attended the school. He often speaks of how Freda Bedi helped him. In April 2017, British journalist Vicki Mackenzie talked with Mandala about her new book The Revolutionary Life of Freda Bedi: British Feminist, Indian Nationalist, Buddhist Nun [available through the Foundation Store]. Mackenzie discussed with Mandala managing editor Laura Miller the origins of the book, Freda Bedi’s many achievements, and how she managed to accomplish several lifetimes of work helping others in just one life. Mandala: What inspired you to write this book? Vicki Mackenzie: I never met Freda Bedi. It was such a shame. But from my earliest days in the Dharma, I heard about her. I went to Kopan in November 1976 for my first course there, and she had just visited. There was a buzz because Lama Yeshe had brought her into the gompa, into “the Tent” as it was then called, and put her on the throne. He made three full-length prostrations to her. Unfortunately, she died shortly afterwards, in 1977. Then when I was writing the book Cave in the Snow, I heard about her from Jetsunma Tenzin Palmo, who had helped her at her Young Lamas Home School. Tenzin Palmo said she was such an extraordinary woman, a powerhouse. She had an incredible life, a big life, many lives in one lifetime. So my ears pricked up. And after Cave in the Snow, Tenzin Palmo kept saying, you really must write a book about Freda Bedi, women need inspirational role models. But I wasn’t interested then because I didn’t want to write a book on another British woman who had become a Tibetan nun! She kept pushing though. And then I got a letter from Ranga Bedi, Freda Bedi’s eldest son, saying we’re looking for someone to write a book about our mother. He said the Dalai Lama thought a book should be written. His Holiness didn’t specify me, but I thought, “Well, if His Holiness thinks a book should be written … I’ll take it on.” So the momentum gathered until I gave in. Mandala: How did you get the information you needed? Mackenzie: The Bedi family wanted the book written, so they handed over their mother’s recordings, letters, writings: it was the next best thing to being able to actually talk to her. She came alive in these materials. But not completely. It would have been so great to interview her. You get the best material when you can sit someone down and ask them the questions that need to be answered and not just take the stuff they want to give you. That way you can also assess the person’s character and “feel.” That made it a difficult book to write. The Bedi children, who are grown-ups now, all gave me interviews. But then I needed to flesh it out. So I did a lot of traveling, finding people who knew her, seeing the places she had loved and where she had worked. It was a lot of talking! Mandala: What about Lama Zopa Rinpoche? He attended the Young Lamas Home School. A young Lama Zopa Rinpoche with the 6th Yongzin Ling Rinpoche (1903 – 1983), senior tutor of His Holiness the Dalai Lama. Photo courtesy of Lama Yeshe Wisdom Archive. Mackenzie: [Lama Zopa] Rinpoche was one of her pupils, who she plucked out of the Buxa Duar refugee camp when he was young and very sick. Rinpoche is always talking about her, so I drew on what I had heard from him. I sometimes wonder if Lama Yeshe wasn’t bowing to her at Kopan partly because she had looked after his heart disciple. One very important interviewee was Akong Rinpoche, who talked to me at Samye Ling, Scotland, just before he was tragically killed. Freda had “adopted” him in 1960 along with Chögyam Trungpa Rinpoche. I interviewed people who had worked with her at the Young Lamas Home School, which she established in 1960. I talked to the volunteers who knew her at the school, and Indians who knew her socially, friends of her family. I interviewed Gelek Rinpoche, who had lived with her in Delhi as one of her pupils. With great difficulty, I tracked down her devoted nun assistant—a very feisty character. I found the nunnery that Freda established in India and talked to the nuns who had known her. They were utterly devoted to her, and kept her room locked up as a shrine. I interviewed Tibetan officials who knew her when the Tibetans came into exile, her niece in England, Pema Chödrön, Joanna Macy, and Jetsunma Tenzin Palmo, who very kindly wrote the foreword to the book. It was like trying to piece together a giant jigsaw puzzle. It took me six or seven years. It was very, very difficult to get a comprehensive picture of this extraordinary woman because she was involved in so many activities. Mandala: You mentioned that she lived many lives. Tell me more about that. Mackenzie: Freda won three scholarships to Oxford. She was mega-bright. Curiously, she was determined without actually being ambitious. She didn’t necessarily want to go to Oxford. A school friend’s family asked Freda to study with their daughter to encourage her as she wasn’t very bright. At the last minute, Freda decided to take the examination too. Ironically, Freda got a scholarship and her friend didn’t. The young, in-love Freda at Oxford, England, 1932. Taken by her fiancé, Baba Pyare Lal Bedi. Photo courtesy of Bedi family archives via Shambhala Publications, Inc.
Oxford opened up a whole new world for the provincial Freda. There she met a charismatic Sikh called Baba Pyare Lal Bedi who was the sixteenth direct descendant of the founder of the Sikhs. He got her into Marxism and the Indian independence movement. She met Gandhi, who lectured there, and was deeply impressed. She married Bedi, who warned her that she would spend a lot of her married life waiting outside prison walls, which turned out to be true. 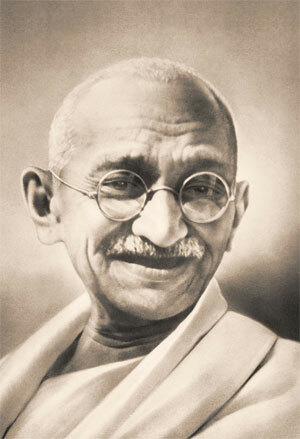 She returned with him to India and joined Gandhi’s peaceful resistance movement against the British. At the same time she was a professor, journalist, and mother. Freda helped to rouse the Indian people with her amazing oratory; she was extremely articulate in Gandhi’s cause. Gandhi chose her personally to be what is known as satyagrahi, one of those willing to go to prison and even die for the cause. Of course she was duly arrested, and became the first British woman to be imprisoned for insurrection. After that, she became a heroine in India. But right from childhood she was a spiritual seeker. She would go to church to try and meditate before school. And she read everything she could on the East. While she was at university and then in India, she explored every kind of spirituality she could, very diligently. She read all of the Koran, the Torah, explored Sikhism and Hinduism. And she continued to meditate and do yoga and had some profound spiritual experiences. But there was no Buddhism in India at that time. Mahatma Gandhi with Lord and Lady Mountbatten, India, 1947. Photo taken at Mahatma Gandhi’s Sabarmati Ashram by Nagarjun Kandukuru. Flickr Creative Commons attribution. She also had a strong social conscience and innate compassion. She was desperately keen to help anybody in need and she hated, hated inequality and suffering of any kind. So after India achieved independence in 1947, she threw herself into working for the refugees who arrived due to the partition of India and Pakistan. There was a bloodbath at the time of partition, if you recall, with traumatized refugees on both sides of the border. So she became a social worker, always working for the poor, especially the rural poor. At the same time she mixed with the great and the good. She knew Indian Prime Minister Jawaharlal Nehru and his daughter Indira Gandhi. She knew Lady Edwina Mountbatten, who was the wife of the last British viceroy of India. The Bedis knew all the leading writers, artists, and politicians and were a celebrated couple at society’s top cocktail parties. Nehru sent Freda to Burma in 1952 on a UNESCO mission. While she was there, she encountered Buddhism for the first time and learned vipassana meditation from Mahasi Sayadaw and Sayadaw U Titthila. She had a kind of awakening experience. She was never the same after that. 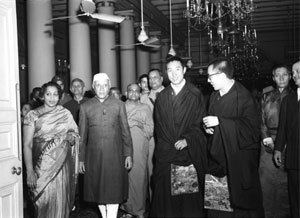 Their Holinesses the Dalai Lama and Panchen Lama on a visit to India in 1957 with Prime Minister Nehru at Raj Bhavan, Calcutta. Photo from public.resource.org via Flickr Creative Commons. And then Nehru sent her, in 1959, to look after the Tibetan refugees in India when His Holiness came into exile. She saw all these refugees, and was working day and night, day and night, to help them, and she saw in them all a spiritual quality she had never seen before. And that was it. It was the tulkus who impressed her the most. She recognized that it was the tulkus who would bring Buddhism to the West. At the time, nobody else was thinking along those lines. Only Freda saw it. Everything was in such disarray. She met Chögyam Trungpa Rinpoche and Akong Rinpoche, and felt a deep affinity with the two of them. She took them into her house in Delhi to live with her family. 1960. 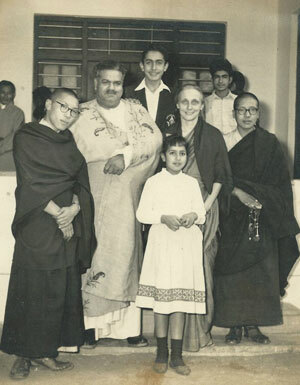 Freda Bedi with family members: her husband Baba Pyare Lal Bedi, her son Kabir, and her daughter Guli on the steps of their small Delhi flat with newly “adopted” family members, Chögyam Trungpa Rinpoche and Akong Rinpoche, found by Freda in the refugee camps. They lived together for several years. Photo courtesy of Bedi family archives via Shambhala Publications, Inc. Following her hunch, Freda set up a school for the young rinpoches. It started in Delhi with Nehru’s permission and help. And His Holiness supported it. He thought that the most important thing for the young rinpoches was an education. Later she moved the school to Dalhousie and Lama Zopa Rinpoche, who had tuberculosis at that time, went there. He was so keen to learn English. And Freda Bedi found him sponsors, and got him robes and medicine. Mandala: Tell me a little bit more about the school. Mackenzie: It was nonsectarian. Freda was never interested in divisions so it was open to all the schools of Buddhism. She taught the tulkus herself, and she commandeered passing Westerners as well to teach English and Western topics. Tibet had been completely isolated, and the young Tibetans didn’t know anything about the outside world. She knew that she had to give them a more comprehensive education. But they also did their prayers and practices according to their own traditions. She was constantly fundraising and getting sponsors for them. She never ever had any money and was totally non-materialistic herself, but she was a very powerful woman, with a great intellect and tremendous connections with the most powerful people in India. 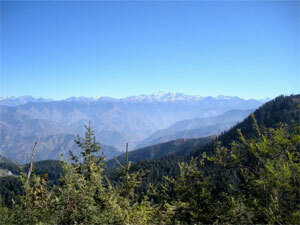 The countryside around Dalhousie, India. Photo by Irfan Shaikh via Flickr Creative Commons. Mandala: And she did some work for nuns as well? Mackenzie: She established the first nunnery in exile. She really, really believed in the equality of women. In fact, in the exile community, the nuns got their first nunnery, Karma Drubgyu Thargay Ling, before the monks got their first monastery. And it’s still going. On a personal note the sixteenth Karmapa Rangjung Rigpe Dorje encouraged her to become the first fully-ordained Tibetan Buddhist nun of any nationality. It was yet another historical milestone she clocked up. She was the first gelongma, which helped pave the way. Tenzin Palmo followed and so did all the others. It’s amazing, isn’t it? Mandala: I understand she did some translation. Mackenzie: She was an ace at languages. She just had a knack. She had studied French; that’s what got her into Oxford. She learned Hindi and Tibetan, and she was translating texts very early on. That was one of her first jobs, which she was doing on the side. She was one of the first translators of Tibetan texts. Kagyu nuns, India. Photo by Olivier Adam. Mandala: Her commitment to helping others meant her family missed her at times. Mackenzie: Missed her because she was away a lot and when she was at home they had to share her. You know, she was called “Mummy-la” by the Tibetans. They all called her Mummy-la and she sort of saw herself as a universal mother. And the Tibetans, most of them, regarded her as an emanation of Tara. But her own children, I think, often took second place. So I explore that in my book as well: the discrepancy between universal mother and actual mother at home cooking meals and generally putting her children before anything and anyone else. Freda never did that! I think it’s often an issue women face. Our myth of motherhood is very strong. Freda undoubtedly loved her children and they loved her, but she also had her eye on the bigger picture. Mandala: Her work has had long-term impacts, hasn’t it? Mackenzie: She got Trungpa Rinpoche a scholarship to Oxford. And he went on from there to America where his impact was enormous. He and Akong Rinpoche established the first Tibetan monastery in the West, in Scotland, Samye Ling. I don’t think you can overestimate the influence of these two lamas. And Lama Zopa Rinpoche’s global influence is inestimable. Freda mentored many other tulkus like Thartang Tulku and Gelek Rinpoche, all of whom have contributed a colossal amount. Freda’s role was pivotal. And she persuaded the sixteenth Karmapa to go on his first tours to Europe and America. She did that personally, because she was his close disciple, living in a room just beneath his in Rumtek, and he listened to her. She said to him, “The West definitely is ready, go, please, please, they are ready, give them the Dharma.” She arranged for him to meet the Pope. She went with him, organizing all the way and acting as his intermediary. Mandala: Was she a serious practitioner? Mackenzie: Yes, which surprised me. I don’t know when she found the time to practice. I discovered that, while she was on these tours to South Africa and America, she was conducting high initiations with the permission of the Karmapa. So she must have been an extraordinary practitioner. And the Karmapa told her assistant, the nun who was with her all the time, that she was an emanation of Tara. She was doing these extraordinary empowerments. Her explanations were exceptionally profound and very clear. In the book, I have tried to put in, especially for Buddhist readers, excerpts of talks she gave while she was doing the overseas tours, both on the radio and live. It seems that she had a high understanding of the Dharma. And her devotion to the sixteenth Karmapa was absolute. She didn’t have to learn guru devotion. Her first meeting with him was remarkable. While she was working with the Tibetan refugees, they told her she must go and meet the Karmapa, who had just arrived. It was a long journey on horseback, and she didn’t really know who he was. But she trekked up to see if she could help him. And he revealed himself to her as the Buddha. He was instantly her heart guru. Her devotion to him was so absolute that it annoyed her daughter, who was brought up by her mother to be an independent woman. “Whatever are you doing obeying everything he says? I thought you were an intelligent, liberated woman!” That was her daughter’s view. Photo courtesy of Shambhala Publications Inc.
Mandala: As a woman, she was quite radical, wasn’t she? For example, she was the primary income earner in her family. Mackenzie: Yes, her husband had a devil-may-care attitude that life would take of itself. And he was in prison too, for years, because of the struggle for Indian independence. So she was the main breadwinner. She didn’t seem to mind. She worked so hard. All the time, work, work, work. And I think she and her husband believed in freedom of choice for both of them actually. It was radical, yes. The Bedis were a remarkable family. Very advanced, very enlightened. They welcomed Freda into their midst, for example, and treated her like a daughter, even though she was British. They were very special people, her in-laws. She loved them, and they loved her. Her husband’s mother lived with them when she was old and they looked after her. Really, they were all characters. That’s something I tried to explore in the book. I didn’t want to do a hagiography. I wanted to show the reality. And Freda was big character, and complex. And in a way she was “called.” Her life had, like Jetsunma Tenzin Palmo’s, a trajectory, even though Freda didn’t meet her guru, her path, until she was middle-aged, by which time she had had an extraordinary life already. She had tasted everything. Career, being a wife, a mother, a socialite, cocktail parties, political activism, jail. But all the time she was always on this trajectory to bring about a better world, to eliminate suffering. She is an icon in the transmission of Buddhism to the West, an icon. And yet, she has remained fairly unknown. Why has her song never been sung? His Holiness was right. Her story deserves to be told. There was even a hint in her letters that it was through her contacts with Nehru and his daughter Indira Gandhi that Nehru was persuaded to take His Holiness in, to let him settle in India. That’s in the book. It’s just hinted at, but she could have been an important influence in that momentous decision. Maybe Lama Yeshe was aware of this other role she may have played too. Then she kept working and working even though her health was never good. On her last tour you can hear on the recordings of her teachings that she can hardly breathe. She was exhausted, physically wrung out—you can hear it. But she kept on going. Apart from teaching and touring, she was still running organizations and getting sponsors for Tibetan causes, refugee camps, and families: she kept that going by endless letter writing. How she did it all, I just do not know. She crammed a lot in! Mandala: How did writing the book impact you? Mackenzie: It’s exhausted me. [Laughs] It has been a long haul, weaving all these strands together and hopefully making her come alive to the reader. I also feel tremendously honored to have spent time with her in this way. She did so very much for India, for Tibetans, for the Dharma, for women. She amazes and inspires me. I feel such gratitude for all she did. Vicki Mackenzie is a British journalist who has written for the national and inter national press for over forty years. Her articles have appeared in The Sunday Times, The Observer, The Telegraph, the Daily Mail and many magazines in Britain and Australia. She’s also the international best-selling author of Cave in the Snow; Reincarnation: The Boy Lama; Child of Tibet; Reborn in the West: The Reincarnation Masters; and Why Buddhism? Westerners in Search of Wisdom. 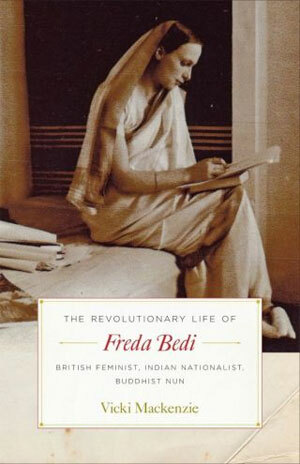 Her latest book is The Revolutionary Life of Freda Bedi: British Feminist, Indian Nationalist, Buddhist Nun, published in March 2017 by Shambhala Publications and available in the Foundation Store. She has been a student of Lama Thubten Yeshe and Lama Zopa Rinpoche since 1976. Surmang (or Zurmang) refers to a vast alpine nomadic and farming region, historically a duchy under the King of Nangchen, with vast land holdings spreading over what is today the Tibet Autonomous Region and Qinghai Province. In Tibetan King of Nangchen's realm was called the "nyishu dza nga" or the 21 (provinces). Since 1959 it is mainly within the Yushu Tibetan Autonomous Prefecture of Qinghai province in China (historically part of Kham, eastern Tibet). Yushu Prefecture is 97% ethnic Tibetan. The Surmang region is one of the poorest regions in China ranking it among the world's highest infant and maternal mortality, almost 100% illiteracy, and personal income of less than US 14¢/day. It is part of the catchment in China of the 30 million ultra-poor. Surmang also refers to a complex of nine or ten Kagyu monasteries (gompas) in that area. These include: Surmang Namgyal Tse, Surmang Dutsi Til, Surmang Do Gompa, Surmang Doka Gompa, Surmang Kyere Gompa. The lineage held therein, known as the Surmang Kagyu, is a subschool of the Karma Kagyu yet it includes a unique synthesis of Nyingma teachings. They are led historically by the GharTengTrungSum (sum means three), namely the Gharwang tulkus, the Tenga tulkus and Trungpa tülkus. Surmang Monastery (Tibetan: ཟུར་མང་དགོན་པ, Wylie: zur mang dgon pa) was founded about 600 years ago by Trungmase, a student of Deshin Shekpa, the 5th Gyalwa Karmapa. The name in Tibetan means "many cornered" referring to the irregularly shaped reed huts used by the first monastics in the area. The 1st Trungpa Rinpoche, Kunga Gyaltsen, was a principal student of Trungmase (the 1st Zurmang Gharwang Rinpoche, also well known as Matiratna, or as Lodro Rinchen, which was given by the 5th Gyalwa Karmapa). Small Surmang is the seat of the Surmang Trungpa tulkus, the line of incarnate lamas particularly associated with the sub-complex Dudtsi-til. The Surmang Trungpa Rinpoches was historically the closest students of Trungmase (1st Zurmang Gharwang Rinpoche), along with the eight tongdens (other close students of the founder of the Surmang group). Zurmang Gharwang Rinpoche, Zurmang Tenga Rinpoche and Zurmang Trungpa Rinpoche are together considered the "Three Pillars of Surmang (GharTengTrungSum)." Accounts of Trungmase and the traditional hierarchy of Surmang differ somewhat. In his autobiography, Born in Tibet, Chogyam Trungpa Rinpoche asserts that Trungmase did not take rebirth, and that the Trungpa tulkus were thereafter traditionally supreme abbots of all of Surmang. However, Trungmase is said to have reincarnated and his line of tulkus is known as the Gharwang tulkus. The Gharwang tulkus have traditionally been the abbots of the main Surmang monastery, Namgyal-tse, and in this role lead the Surmang Kagyu tradition. In 1976 the 16th Gyalwa Karmapa enthroned the 12th Zurmang Gharwang Rinpoche as the 12th incarnation of Trungmase and an emanation of Tilopa. The Surmang monasteries, through their long history, were exposed to violence. Dudtsi-til Monastery was razed twice by the armies of the Central Government of Tibet, the most recent time being in the 1930s, when the Central Government tried to collect taxes in Tibetan areas of Qinghai. The Surmang monasteries were again largely destroyed during the Chinese invasion of Tibet and the subsequent Cultural Revolution. 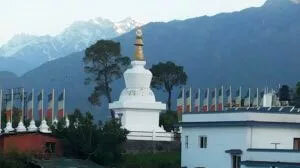 In recent years Namgyal-tse has been largely restored under the leadership of the 12th Zurmang Gharwang Rinpoche. Dutsi-til Monastery is being steadily reestablished under the leadership of Sakyong Mipham Rinpoche, the spiritual leader of Shambhala Buddhism and son of Chögyam Trungpa, the 11th Surmang Trungpa. The 2010 Yushu earthquake made it necessary to raze the ancient assembly hall, all of whose costs have been borne exclusively by local support: the monastery, local business community and the Yushu Government. The present regent abbot of Dutsi-til is Aten Rinpoche. The titular head of the monastery is Choseng Trungpa Rinpoche, the 12th Trungpa Tulku. The three famous Tulkus from Zurmang are well known with the name GharTengTrungSum (Gharwang, Tenga, Trungpa Rinpoche). Zurmang Gharwang Rinpoche II and Zurmang Tenga Rinpoche II are the grandson of TrungMase / Matiratna (1st Zurmang Gharwang Rinpoche). Surmang Foundation was founded in 1988 by Lee Weingrad following his trip to the region in 1987, making him the first Westerner to visit the region. In 1991, the Foundation went into partnership with the Dutsi Til Monastery and the Qinghai Provincial Government resulting in the construction of a clinic. The agreement, the first one signed by the Chinese Government with a foundation in Qinghai, opened the door for other foundations in Qinghai, most notably the Konchok Foundation. Since 1991 the foundation provides community development and health services to the region, including support of monks, nuns, and visitors to the facilities at the retreat center of Dorje Khyung Dzong. The Foundation was also responsible for the arrangements and logistics of the 2001 visit of Trungpa Tulku XI's son, Sakyong Mipham Rinpoche. The Greek-Armenian philosopher and mystic G.I. Gurdjieff claimed that a mysterious Sarmoung monastery was a major source of the teachings he brought to the West. As such, it has never been located, but the Canadian diplomat and Gurdjieffian James George has speculated, on the basis of the similar name and location, that Surmang may be real basis of the Sarmoung monastery. As I helped Rinpoche up the stairs to bed that night he said, "Johnny, do you know what killing that bird means?" "It means you will get married and your first child will be a boy who will be a tulku. Also it will cause a slight interruption in our living situation." I was dumbfounded. I had no idea what relationship there was between the events of that morning and my having a son. Rinpoche didn't expand on it, so I let it go and silently put him to bed. Two days later Rinpoche and Max were in town shopping and got stuck in a heavy snowstorm. They had to stay overnight at an inn. Rinpoche called and told me with a chuckle, "We've been held up by a snowbird." A slight interruption. Interestingly, I have not killed anything since. Later I did get married and our first child was a daughter whom we called Sophie. 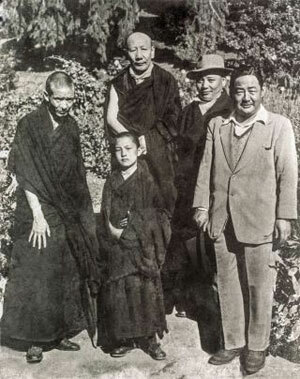 Rinpoche announced that she was a reincarnation of G. I. Gurdjieff. "But Gurdjieff was a man," I said. "Yes," said Rinpoche, "that's Gurdjieff's joke on us." 5. Born In Tibet (4th ed.) by Chogyam Trungpa. Shambhala Publications, 2000 ISBN 1-57062-714-2 pg 153-4. 7. Fordham, Walter (October 2003). "Interview with James George: June 27th, 2003". Chronicles of Chögyam Trungpa Rinpoche. Retrieved 1 April 2015. Gurdjieff spent three and a half years in Tibet. He wrote ... that he was taken to a central Asian monastery in Kashmir or Tibet called a monastery of the Sarmoung brotherhood. Now, Surmang, the seat of Trungpa's lineage, is just a transposition of vowels, which I think, may conceal where Gurdjieff received much of his teaching. Jetsunma Tenzin Palmo was born in England in 1943 and named Diane Perry. She and her older brother were raised by her mother in the Bethnal Green area of London after her father’s death when Diane was 2 years old. Mrs Perry was a spiritualist who held séances in the family home, and Jetsunma credits this as being a strong and positive influence on her development as a seeker of truth. Aged 18, she realised she was a Buddhist while reading the book “The Mind Unshaken” by John Walters. After leaving school she worked as a librarian at the Hackney Public Library and then SOAS (The School of Oriental and African Studies) in London, saving enough money to leave England in 1964, sailing to India to pursue her spiritual path. She headed north to Dalhousie in Himachal Pradesh, where she had arranged to work with an expat Englishwoman named Freda Bedi, who had opened a school for young reincarnated lamas among the exiled Tibetan community. On her 21st birthday in June 1964, the school had a special guest: His Eminence the 8th Khamtrul Rinpoche, a great Drukpa Kagyu lama. Diane recognised him immediately as her Guru and asked him if she could become a Nun. Aged 21, only 3 months after arriving in India, the newly named Drubgyu Tenzin Palmo became one of the first Westerners to be ordained as a Tibetan Buddhist monastic. In 1967 she received the sramanerika ordination at Rumtek Monastery in Sikkim from H.H. the 16th Karmapa. As full ordination is not yet available for women in the Tibetan tradition, in 1973 she travelled to Hong Kong to obtain the bhikshuni ordination at Miu Fat Temple. 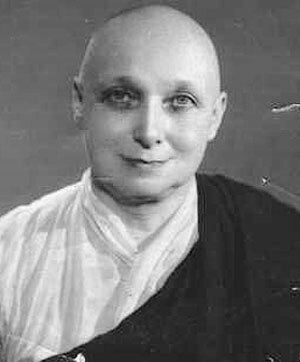 Tenzin Palmo was based with Khamtrul Rinpoche and his community first in Dalhousie and later at the monastery of Tashi Jong, near Palampur, Himachal Pradesh for six years until 1970, when he directed her to the Himalayan valley of Lahaul in order to undertake more intensive practice. She stayed in Tayul Gompa, a small Lahauli monastery for the next 6 years, remaining in retreat during the long winter months. Then in 1976, seeking more seclusion and better conditions for practice, she found a cave a couple of hours hike from Tayul, at 13,200 feet above sea level. The cave was enhanced by building enclosing walls, creating a living space around 6 feet (1.8 metres) square. In the summer months supplies were delivered from Keylong and she grew turnips and potatoes nearby. She stockpiled for winter, when the cave was snowbound. She slept and meditated upright in a meditation box. Despite many hardships and life-threatening experiences, Tenzin Palmo thrived in her solitary spiritual practice and lived in the cave for 12 years, from the ages of 33 to 45. For the first 9 years she occasionally had visitors or took trips away from the cave, while the last 3 years were spent in strict retreat. Her retreat ended in summer 1988 and after 24 years in India, she returned to Europe to stay with friends in Assisi, Italy. There she rediscovered her western roots and started to accept requests to teach. 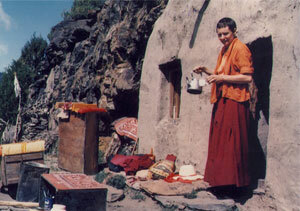 Tenzin Palmo drying out furniture at her Cave in the early 1980s. Before H.E. Khamtrul Rinpoche passed away in 1980, he had on several occasions requested Tenzin Palmo to start a nunnery. She understood the importance of this and remembers when in 1993, his reincarnation, H.E. the 9th Khamtrul Rinpoche together with the Lamas of the Khampagar monastery at Tashi Jong again made the request. This time Tenzin Palmo was ready to take on the formidable task. Legal preparations began, suitable land was found near Tashi Jong and she began slowly raising support worldwide. After the publication of her biography “Cave in the Snow” by Vicki MacKenzie in 1998, her profile increased exponentially and she began annual international teaching tours to raise funds. In January 2000 the first nuns arrived while Tenzin Palmo was still based at Tashi Jong and in 2001 construction began at the Padhiarkar site. H.E. Khamtrul Rinpoche gave the nunnery the name Dongyu Gatsal Ling, which translates as “Garden of the Authentic Lineage”. Today, DGL is fully completed and provides educational and spiritual instruction to over 100 nuns. In addition to her role as Founding Director of Dongyu Gatsal Ling Nunnery, Jetsunma is President of Sakyadhita International Association of Buddhist Women, Founding Director of the Alliance of Non Himalayan Nuns; Honorary Advisor to the International Network of Engaged Buddhists and Founding Member of the Committee for Bhiksuni Ordination. To find out more about Jetsunma Tenzin Palmo’s life, read Vicki Mackenzie’s biography Cave in the Snow published by Bloomsbury, and see the ‘Cave in the Snow’ DVD directed by Liz Thompson and narrated by Rachel Ward. Rosamund Burton meets an extraordinary woman embodying faith, perseverance and the pursuit of happiness for others. Tibetan Buddhism does not at this time have full ordination for its nuns and is, despite its highly evolved spiritual practices, still very much a male bastion. Yet Tenzin Palmo has not only earned the admiration of people all over the world, but also the deep respect of many Tibetan Buddhist lamas, not to mention His Holiness the Dalai Lama. Originally from the East End of London, she became a Tibetan Buddhist nun in the 1960s and spent 12 years living alone in a cave high up on a mountain before founding the Dongyu Gatsal Ling Nunnery. In February this year, Tenzin Palmo was given the title of “Jetsunma”, which means “venerable master” by His Holiness the Twelfth Gualwang Drukpa, the head of the Drukpa Kagyu lineage – the particular form of Tibetan Buddhism to which she belongs. I have read Vicki MacKenzie’s wonderful book, “Cave in the Snow”, about Tenzin Palmo, and now I find myself face to face with this extraordinary woman who has survived incredible physical hardships in her dedication to her meditative practices. She is currently undertaking a tour of Australia, giving public talks and seminars, and is speaking in Melbourne on 1st, 3rd and 4th May, before going to Sydney for the Happiness Conference on 9th and 10th May. I wonder what effect so much spiritual practice has had. On the one hand she seems very normal. She smiles and chats, and I feel instantly at ease. Then I feel her brilliant blue eyes pierce and touch me in an indescribably profound way. She is extremely eloquent and answers my questions in a very systematic and logical way, and as she laughs or emphasises a point, you are aware of a strong underlying serenity. This is the woman who made a vow to attain Enlightenment in the female form no matter how many lifetimes it takes. Theravadan Buddhism, which is practiced in Thailand, Laos, Burma, Cambodia and Sri Lanka, and Tibetan Buddhism do not have fully ordained nuns. Therefore, in these countries the nuns have been ordained by the monks, but that means they are always novices, because full ordination must be given by a nun who herself is fully ordained. In Tibetan Buddhism, Tenzin Palmo explains, remaining as novices means that there are many texts which nuns are not allowed to study, and also offices and rituals which they can not carry out. His Holiness the Dalai Lama, she continues, is very supportive of the move to enable nuns to receive full ordination, but knows that his geshes are not supportive, and doesn’t want to move on this issue if the rank and file are not really behind him. His Holiness the Dalai Lama has suggested that Tibetan Buddhist nuns go to Hong Kong to be ordained, as Tenzin Palmo did herself in 1973 when she was thirty years old, but she explains, the nuns do not want to go outside their own lineage. Tenzin Palmo, then known as Diane Perry, was born on 30 June 1943. Her father was a fishmonger and died when she was only two, so she was brought up by her mother and older brother, living above their fish shop in Bethnal Green. Her mother was a spiritualist, and the weekly séances held at their home meant that this young girl was used to unusual spiritual experiences. In “Cave in the Snow” there is description of the night the large mahogany table with an 18 stone woman sitting on it lifted off the ground and into the air. Diane Perry’s realisation that she was a Buddhist occurred when she picked up a book called “The Mind Unshaken”. She started studying Buddhism and discovered that it was the Mahayana branch that interested her, which is practiced primarily by the Tibetans. With further reading she realised that the school she needed to study was Kargyupa and, aged 20, she decided to travel to Dalhousie in Northern India where an English woman called Freda Bedi had started a small nunnery for Kargyupa nuns, and a school for young reincarnated lamas. 1963 was an extraordinary time to be in Dalhousie because it was a major Tibetan refugee centre, and the great monasteries that had been recently destroyed when the Chinese invaded Tibet were being re-established there. She met her guru, His Eminence 8th Khamtrul Rinpoche, and she became the second Westerner to be ordained as a Tibetan Buddhist nun. She stayed with Khamtrul Rinpoche and his monks for six years, but became increasingly frustrated and despondent about being unable to learn the teachings which the monks had access to. Finally, one day she told her guru she was leaving. At that point he instructed her to go to Lahaul, a remote region of the Indian Himalayas near the Tibetan border, in order to undertake more intensive practice. She stayed in a small monastery there for several years and then, wanting more seclusion for her practice, she found a small cave up in the mountains above Lahaul. The cave was only six feet deep and ten feet long, and, because she was training herself to do without sleep, she did not even have a bed, but only a wooden meditation box. Here she lived for the next twelve years, and for the last three years in strict solitary retreat. One winter there was an avalanche and the snow completely blocked her door, so she had to dig herself out. Another time a supply of food she was expecting never arrived, and she had to eke out her minuscule supplies for months. 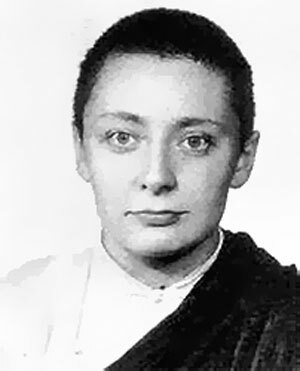 Tenzin Palmo’s three year retreat came to an abrupt end in 1988 when a policeman knocked on her door saying there was a problem with her visa, and that she would be arrested if she did not report to the local police station the following day. Having been in India for 24 years, and suddenly no longer in retreat Tenzin suddenly felt she needed to return to the West. Friends invited her to stay with them in Assisi, so she went there. 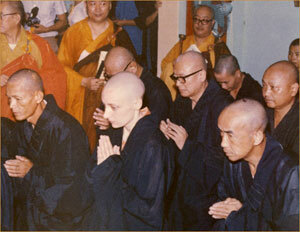 Before HE Khamtrul Rinpoche died in 1980 he had asked Tenzin Palmo several times to start a nunnery. Then in 1993, she attended the first Western Buddhist conference held in Dharamsala, at which she spoken passionately about the plight of women in Buddhism. Shortly after this, she took on the task of starting a nunnery for the women of her order, and began to give talks all around the world to raise funds and interest in the project. In January 2000, the first nuns arrived and in 2001, the construction of Dongyu Gatsal Ling nunnery began. Today, there are 45 nuns from aged 15 to 25. Some are from Tibet and others from nearby countries such as Bhutan and Ladakh. They undertake an initial six-year program, after which they may choose to do a long retreat and, if they have the necessary qualities, go on to train as Togdenmas, the female equivalent of the highly spiritual Togdens. Tenzin Palmo is 65 years old this year and admits that after a tour of Europe in 2009 she is not going to do any more traveling. She says that she is always telling the nuns that as soon as they are ready, she would like them to run the nunnery themselves. “At that time it will certainly be good to go back and do some more strict practice,” she says. At her public talk in Sydney she will discuss the mind and the control it has over us. Rather than trying to control our minds, she explains in her slightly European sounding accent, which has no trace of her East End roots, most of us try and control our external circumstances. We put a lot of effort into creating what we believe will make us happy, such as acquiring money, relationships, houses and cars, and then find we are still not content. “We have to start cleansing our minds,” she says, and becoming mindful, and to do that we need to become more present. Tenzin Palmo adds that it was both admirable and brave of Kevin Rudd to bring up the Tibet question on his recent trip to China. She believes that the best strategy for the West at this time is to try and put a little pressure on China to get them at least to talk with His Holiness the Dalai Lama. She says that Western countries need to have the integrity to say to China that they are not prepared to trade with them unless they have a better code of ethics when it comes to human rights. This is how Tenzin Palmo has lived her life and it would be true to say that she has brought enormous happiness to the many people with whom she has come in contact. Dominique Butet and Olivier Adam profile Tenzin Palmo, the nun who is changing the role of women in Tibetan Buddhist traditions. Translated from French by Susan Maneville. A few days after Losar, the Tibetan New Year, spring seemed to be dawning on the Kangra plain, situated in Northern India in the province of Himachal Pradesh. Bougainvillea and magnolias were in full bloom, brightening up the dominating green of the region. The weather was already hot when our taxi dropped in front of the open gates at Dongyu Gatsal Ling, a community of ninety Buddhist nuns founded by Tenzin Palmo nearly fifteen years ago. Straight away we wondered what pushed Diane Perry, a young English woman who had grown up in London, to leave everything behind for India, shaving off her lovely chestnut curls to become the second Western nun in the history of Tibetan Buddhism. 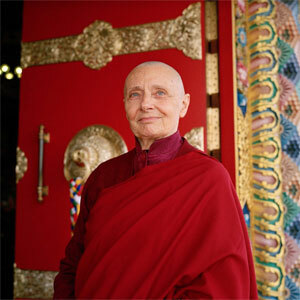 Now known as Tenzin Palmo, she is over 70 and what she has accomplished has become a living source of inspiration. We arrived at the convent door. She greeted us with a large smile and a firm, generous handshake. She modestly agreed to talk about herself. “Reading my first book on Buddhism at 18 is what changed my life completely,” she’s said. When she was halfway through it, she announced: “I’m a Buddhist” — to which her mother replied, “Finish the book and we’ll talk about it!” But Diane had found her spiritual path and would follow it with all her strength. When he arrived at the school a few weeks later, she hurried to greet him, without daring to look at him directly. She whispered to her headmistress: “Just tell him I want to take refuge with him.” “Of course,” he answered. “I knew immediately,” she says, “that he was my master. And he knew immediately that I was his disciple.” The eighth Khamtrul ordained young Diane as a nun and gave her the name Tenzin Palmo. She went with him to the Tashi Jong monastery in Himachal Pradesh, where she discovered the existence of the Togden, “beings who have realized the nature of the mind and are able to control it, after a retreat of more than fifteen years.” With their hair in dreadlocks and wearing the white robe inherited from Milarepa, these yogis were said to have unusual spiritual capacities. The young nun learned that while in Tibet, her guru lived among the Togdenma (the female Togden), though they did not survive the Chinese Cultural Revolution. Tenzin Palmo was only twenty-six when the Khamtrul encouraged her to go on a retreat and sent her to Lahaul, near Keylong. “This retreat was a vocation for me, it was what I was called to do in life,” she recalls. The cave she chose for her purpose was situated at an altitude of 4300 meters, difficult to access. She would spend twelve years there. “Another advantage of the cave,” she says, is that it always gives you the space necessary for perfect concentration. And for me this was a source of great joy. I wouldn’t have wanted to be anywhere else.” Did she have any difficulties? “Of course, certain days were marvelous and there were others of extreme unease when I wished I could do something other than sitting and meditating! But, these highs and lows are natural. Whether it rains or the sun shines is not important. The weather passes and we continue meditating.” Was it more difficult for a woman to live as a hermit in the mountains? “Not at all,” she replies. Next we asked Tenzin Palmo about the actions she’s led in favor of women. Her enthusiasm was unmissable. Indeed, in June 2015, she took part in the Sakyadhita Conference, an international gathering of female Buddhists created in 1987 of which she has been chairperson since 2013. Her presentation there concerned the non-Himalayan nuns. 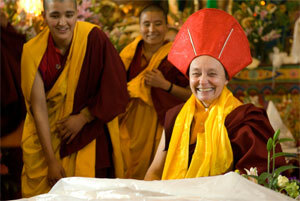 Jetsunma Tenzin Palmo is one of the first Western women to be ordained as a Tibetan Buddhist nun. She is also the most senior Western Tibetan Buddhist nun, being ordained for over 51 years. Palmo is a nontraditional woman’s rights activist and a respected teacher. She has spent years in strict retreat, authored books, opened a nunnery, and vowed enlightenment. A woman dedicated to the dharma and to her fellow nuns, Palmo is an exceptional being. Diane Perry, now Tenzin Palmo, was born in Hertfordshire, England on June 30, 1943. Growing up in London, she felt wrong. Palmo believed she was in the wrong place and the wrong body, wanting to leave London from an early age. Her mother was a widow of poor health, but a pleasant disposition. Spiritual séances would occur weekly at their home exposing Palmo to an open mindset. She had a kind family and a lovely job as a librarian. She spent a lot of her childhood reading about different religions, though she could not identify with any. When Palmo was eighteen she was delayed in an airport with her mother and the only book with her was about Buddhism. Palmo declared halfway through the book that she was a Buddhist. Her mother’s remark was how nice that was. A few years later she informed her mom she would be leaving for India for a Buddhist teacher, again her mother was supportive asking when she would depart. Her mother, leading a spiritual life, understood her daughter would follow her own path. 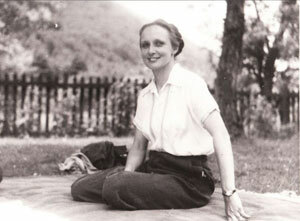 Palmo wrote Freda Bedi, a Western woman teaching English to Tibetan refugees in India. Bedi’s response was simply telling Palmo to come. So at the age of twenty Palmo moved to India to teach English at the Young Lamas Home School and by her twenty-first birthday she met the 8th Khamtrul Rinpoche, her root guru. Tenzin Palmo was ordained in the Vajrayana tradition in 1964. The name given, Drubgyu Tenzin Palmo means “Glorious Lady who Uphold the Doctrine of the Practice Succession”. She was ordained as a novice nun until in 1973 she was ordained as a full bhiksuni. Palmo lived at Khamtul Rinpoche’s monastery for six years, the sole nun amongst a hundred monks. While the monks did not harass Palmo at all, they would inform her it wasn’t much her fault that she was a female and they prayed she would be reborn a male so she could more readily practice. After a while, Palmo left at the advice of her guru and traveled to the mountain region of Lahaul. Palmo enjoyed the monastery, but wanted solitude. She discovered there was a cave nearby and wished to go for retreat. Several people discouraged her from this endeavor saying she would be raped or freeze to death. However, after discussing the matter with her guru she was fortified and at the age of thirty-three she moved into the cave. Palmo spent nine years in the cave, going to the monastery to hear teachings and to gather food and supplies. The solitude was lovely, but she decided to enter complete isolation and do a long retreat. At the end of this retreat she was informed she was in India illegally due to visa problems. It was 1988. She moved to Italy and has been active in the fight for equal rights for Buddhist nuns. Palmo traveled and fundraised so that she could open a nunnery, as she had been requested to do by her root guru for several years. The Dongyu Gatsal Ling Nunnery opened in 2000 for women from Tibet and the Himalayan border. The women receive education and training at the nunnery. Palmo also intends to restart a dead lineage of togdenmas at the nunnery. Palmo is now a member of the “Committee of Western Bhikshunis” which is meant to aid the establishment of bhikshuni ordination in Tibetan traditions. She received the title Jetsunma (reverend lady) in 2008 for her active involvement in encouraging female status in Buddhism. Jetsunma Tenzin Palmo is revered worldwide for her dedication and work for females in Tibetan Buddhism. She has made a vow to attain enlightenment in the female body no matter how many rebirths it takes. Having spent twelve years in a cave, similar to some of the most dedicated yogis, Palmo has transcended the limits of female accomplishment in Buddhism. Changing the mind of monks one day at a time, Palmo continues to offer opportunities to other women through her growing nunnery. True devotion can as easily be seen in the acts of nuns dedicated to equal chance. Tenzin Palmo is a revolutionary bodhisattva. One night Olcott was dozing off, when suddenly he had a vision of an ethereal figure wearing a turban. The figure spoke encouraging words to him and told him to travel to India. It said that the country was the cradle of the oldest civilization and Hinduism was being chipped away by Western colonialism. It urged him to initiate a rebirth of traditional Eastern religions, including Buddhism and Hinduism. 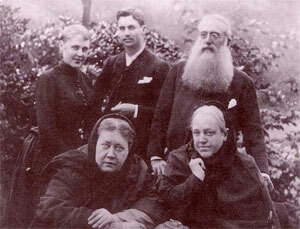 Blavatsky and Olcott took heed of this vision and moved to India, where they were welcomed for their embrace of Hinduism and aversion to the British elite. The Indians weren’t used to Westerners encouraging the practice of their native religion, and expected them instead to try to convert them to Christianity, like the Western missionaries in India at the time. Blavatsky's health eventually started to fail, forcing her to move to London. There she founded the Blavatsky Lodge and was visited by Mohandas K. Gandhi, who was receiving a Western education and studying to become a lawyer. Obviously, she was met with some resistance and spent time in jail for a few months, but was eventually released and made president of the Indian National Congress for one year. The man who petitioned for her release from prison and who became her successor was none other than Mohandas Gandhi, when he returned home from his time spent in South Africa. •	Thacker, Elizabeth Lorelei. "Mahatma Gandhi and the Theosophical Movement (1)" The Canadian Theosophist 64.5 (Nov-Dec 1983), 97-106, 117. This article in two parts is a very thorough and well-researched examination of MKG and his connections with the Theosophical Movement. •	Thacker, Elizabeth Lorelei. "Mahatma Gandhi and the Theosophical Movement (2)" The Canadian Theosophist 64.6 (Jan-Feb 1984), 123-130. 1. Mohandas Karamchand Gandhi, The Story of My Experiments with Truth (Ahmedabad: Navajivan Publishing House, ), 50. 2. Stanley Wolpert, Gandhi's Passion: The Life and Legacy of Mahatma Gandhi, Oxford University Press, 2002. Excerpt online at Beliefnet.com. 3. Mohandas Karamchand Gandhi, The Story of My Experiments with Truth (Ahmedabad: Navajivan Publishing House, ), 50-51. 4. Mohandas Karamchand Gandhi, The Story of My Experiments with Truth (Ahmedabad: Navajivan Publishing House, ), 50-51. 5. "Chronology of Mahatma Gandhi's life/England 1888-1891", Wikisource. 6. Mohandas Karamchand Gandhi, The Story of My Experiments with Truth (Ahmedabad: Navajivan Publishing House, ), 196-197. 7. Annie Besant, "On the Watch-Tower" The Theosophist 36.9 (June, 1915), 189. 8. Max Wardall, "A Visit to Ghandi [sic]" The Messenger 14.1 (June 1926), 1-3.